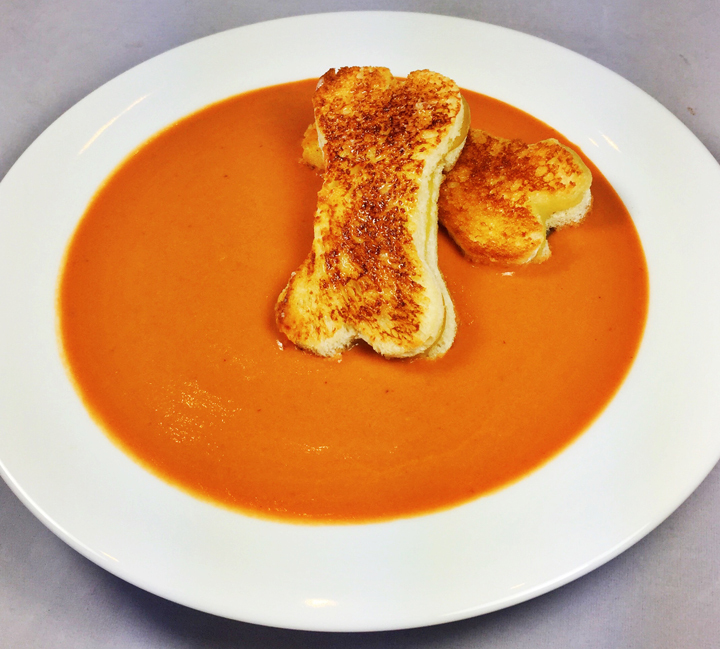 Our “not so scary Blood and Bones” themed Halloween dinner has a delicious bowl of homemade tomato soup served with mini grilled tomato “bone” sandwiches. Quick and easy to make, it’s the perfect festive dinner before heading out to your Halloween celebrations. In a large saucepan, heat the oil and butter over medium heat until the butter melts. Add the onion, carrot, and garlic, occasionally stirring, until the vegetables are softened but not browned, about 8 minutes. Add the flour and stir to coat the vegetables and garlic. Add the wine and cook until the wine is almost completely evaporated. Add the stock, tomatoes, rosemary, and 1/4 teaspoon each kosher salt and fresh ground pepper. Increase the heat to medium and bring to a strong simmer, stirring, so the mixture doesn’t stick to the bottom of the pan. Reduce the heat to low, cover, and simmer for 40 minutes. While the soup cooks, make the grilled cheese “bones.” Cut 16 bone shapes out of the bread. Cut 8 bone shapes out of the cheese. Heat a large sauté pan over medium heat. Thinly spread the butter over one side of each 16 bone shaped bread. Place 8 in the sauté pan and top with one piece of cheese. Place the other bone shaped piece on top of the cheese, butter side up, as the cheese begins to melt. When browned, turn over and cook the other side until also browned. Remove from the sauté pan and keep warm while you finish the soup. To finish the soup, discard the rosemary stem and add 1 teaspoon of salt and ½ teaspoon of black pepper. Using an immersion blender, purée the soup or use a blender or food processor and puree in two or three batches. Return the soup to the pot, whisk in 1 cup of cream and reheat to warm. Season to taste with salt and pepper and add to 4 warmed bowls. Add two “bones” per bowl of soup.